I am addicted to the food network. I have been watching it for years and one of my favorite shows is Iron Chef. While I prefer the more campy style of the original Japanese version, I still enjoy the food network version. I get lots of inspiration from this show. I love that they focus on one ingredient and then make several dishes where that secret ingredient is the star. The secret ingredient on the show I just watched was broccoli. Growing up I was not a fan. Its one of those vegetables that you either liked or didn’t like. My parents didn’t understand this dislike, nor some of my other food quirks but always said that someday I would change my tune. Well this is true for many things I wouldn’t eat as a kid. I didn’t like tomatoes, mac-n-cheese, asparagus, peas, broccoli, and the list goes on and on. These days I eat all of these items, including broccoli, and love them. I don’t know why I did not like them as a kid, but I am glad as an adult that I am not missing out. Anyway, after watching the last Iron Chef I was inspired to create a new broccoli dish. It actually combined components from two things I wouldn’t eat as a child, broccoli and mac-n-cheese. Of course, eating primally meant that I couldn’t use macaroni, so I combined the broccoli with the cheese sauce from mac-n-cheese to create a dish that was truly delicious and of Iron Chef proportions: I call it Broc-n-Cheese. It looked so good that I coul not wait to eat it when it came out of the oven all hot and bublly and I forgot to take a picture until after we had already devoured more than half of it. I’ll post the picture, but be warned, its not pretty. It was pretty before I got my hands on it, but, oh well, if your squeamish, just don’t look, but be sure to make it. This is not the broccoli with cheez wiz sauce your mom made at thanksgiving every year, but a more refined and tasty version. The broccoli is roasted first to give it a crisper feel and better taste. The cheese sauce is rich with egg and vermouth, and the crispy topping comes from pork rinds not bread crumbs. Its perfectly primal and good for you and makes a great accompaniment to your favorite roasted meat. Broccoli is known for its anticancer properties but did you know it could also boost the immune system in older people and slow down the effects of ageing, according to research by Dr. Andre Nel from UCLA. A chemical found in this cruciferous vegetable called sulforaphane was found to activate a number of antioxidant genes and enzymes in immune cells. These prevent free radicals from damaging cells. Free radicals are byproducts of normal body processes, such as the conversion of food into energy. They are a supercharged form of oxygen, which can cause oxidative tissue damage leading to disease – for example, triggering the inflammation process that causes clogged arteries. So I say eat broccoli. 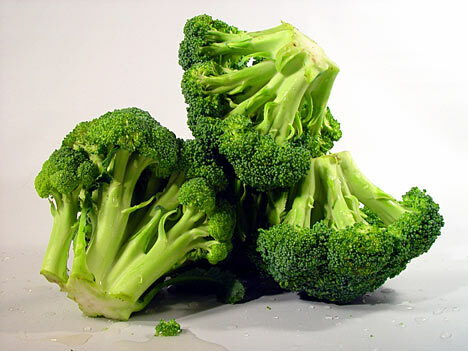 Prepare the broccoli by cutting the tops into florets. Peel the stalk and slice into 1/4″ slices. Place the broccoli florets and stalks on a cookie sheet and spray with olive oil and add salt and pepper to taste. Toss the broccoli to coat with the olive oil. Place in a 400º preheated oven for about 30 minutes. You want the broccoli to become browned well, but not burned, so keep your eye on it. While the broccoli is roasting, prepare the cheese sauce. Place the milk, yogurt or cream cheese and vermouth in a sauce pan and place on the stove over medium low heat and heat to just about simmer. Stir often and keep you eye on it so it doesn’t scald. Beat the eggs. When the milk comes to just a simmer, add some to the eggs, stirring to temper the eggs (you don’t want to scramble them). Add the remaining milk to the eggs and stir to incorporate. Place the egg milk mixture back in the sauce pan and cook on low heat until it starts to thicken. Stir often. I found that when the mixture coats the back of a spoon it is thick enough. When the milk egg mixture has thickened, add 8 oz. of cheddar cheese and 4 oz. of blue cheese along with the cayenne pepper to it and stir to completely melt the cheese. This makes a fairly good amount of cheese sauce and you may have some left over. By this time, the broccoli should be done and removed from the oven. Lower the heat on the oven to 350º. 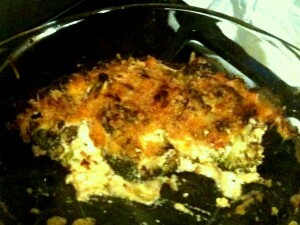 Now, in a medium size glass baking dish combine the broccoli and half of the cheese sauce. You want there to be enough cheese sauce to completely coat and cover the broccoli. Add more cheese sauce if necessary and keep the rest for another time. Spread the remaining 4 oz. of shredded sharp cheddar cheese on top and then spread the pork rind crumbs on top of that. Place in the oven for about 30 to 25 minutes until it is hot and bubbly. If you like the top browned and crispier you can broil it at the end for a couple of minutes. Remove it from the oven and serve. The next evening I used the remaining cheese sauce in a similar dish, but, instead of using broccoli, I used about 3 – 4 cups of cubed and parboiled rutabaga and butternut squash. You can substitute other vegetables as well. I think roasted cauliflower would be really good in this dish as well. Play around using different vegetables and cheeses to come up with your favorite combination.